In this tutorial we are going to look at how to create custom window decals for business and advertising purposes. Window decals can be a great way of getting people’s attention. The first part of this blog post will be a Photoshop tutorial creating a window decal with frosted film. This is ideal to get that elegant advertising surface look that works well for shops. 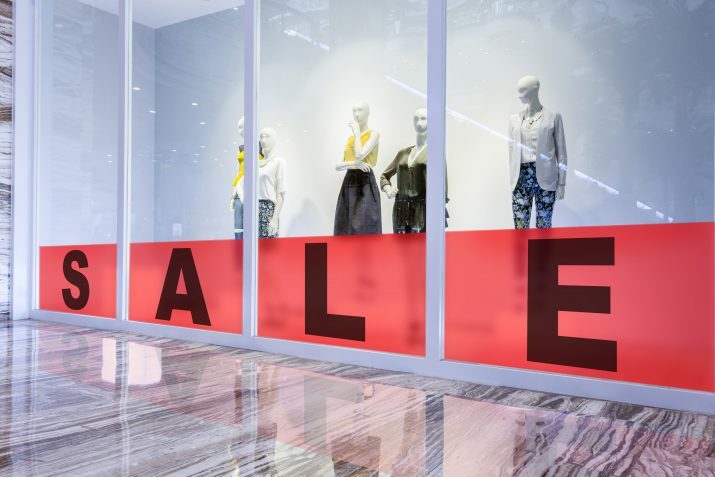 This window decal will be for announcing a sale in a shop. The second part of the tutorial will show you how to make perforated window decals for vehicles, in this case a bus. The perforated film is the perfect choice when you still want to let light through, but still want really bright colours. 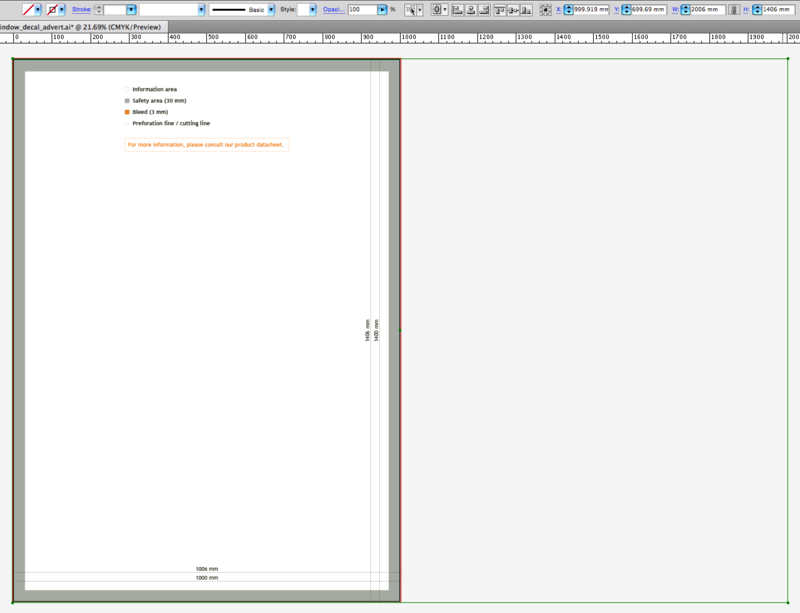 The print files of our tutorial will be created in Illustrator. Start by downloading the template for the window decals size 140 x 100 cm in landscape mode. Select the PDF template, since we are using it in Photoshop. 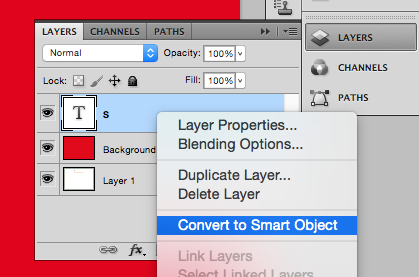 Import the PDF file into Photoshop and make a new layer in the Layers panel and call it “Background”. 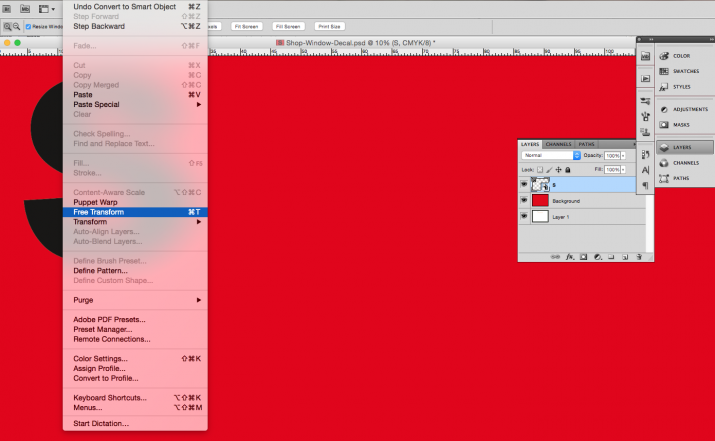 Choose a red colour, C=0 M=100 Y=100 K=0, for the background by double clicking the front colour square in the tools panel. 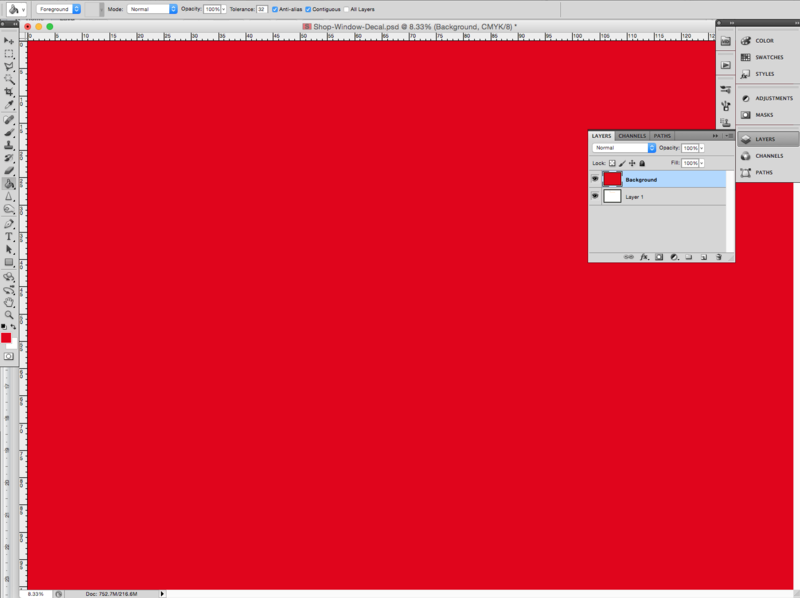 Use the Paint Bucket Tool (G) and click somewhere on the canvas. 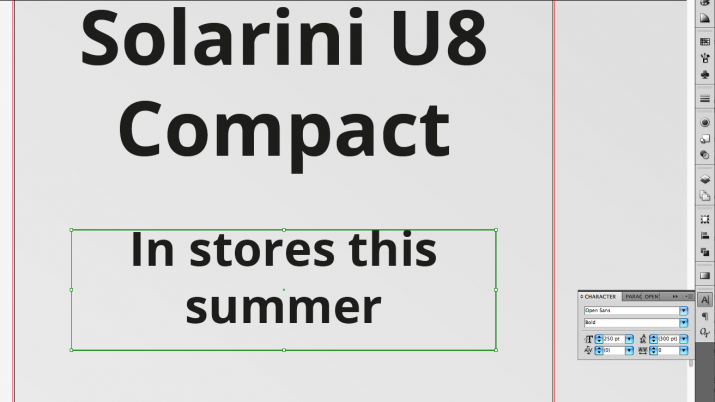 Use the Horizontal Type Tool (T) with the font Arial Black and use the colour black, C=0 M=0 Y=0 K=100. 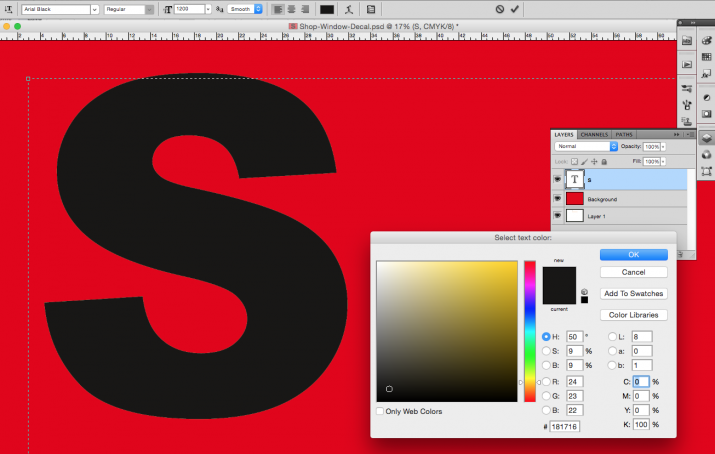 Type the first letter, S.
Right click on the layer with the S in the Layers panel. Click on Convert to smart object. 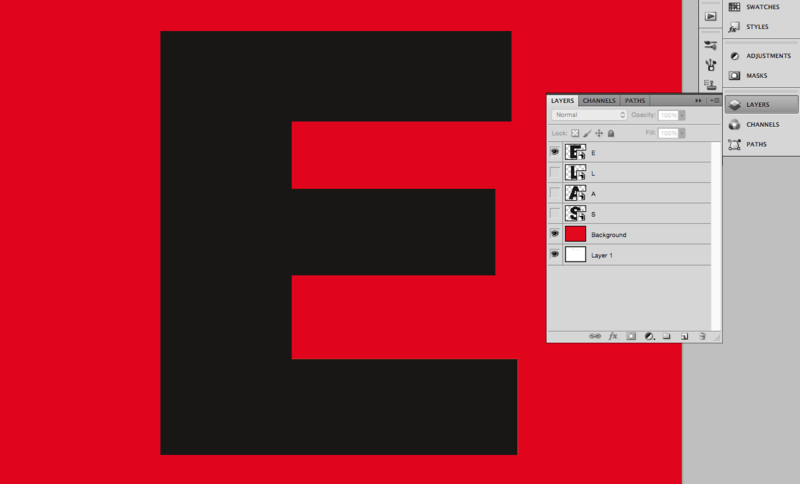 Resize the letter by clicking Edit > Free Transform. Set the letter to be 90 cm high. 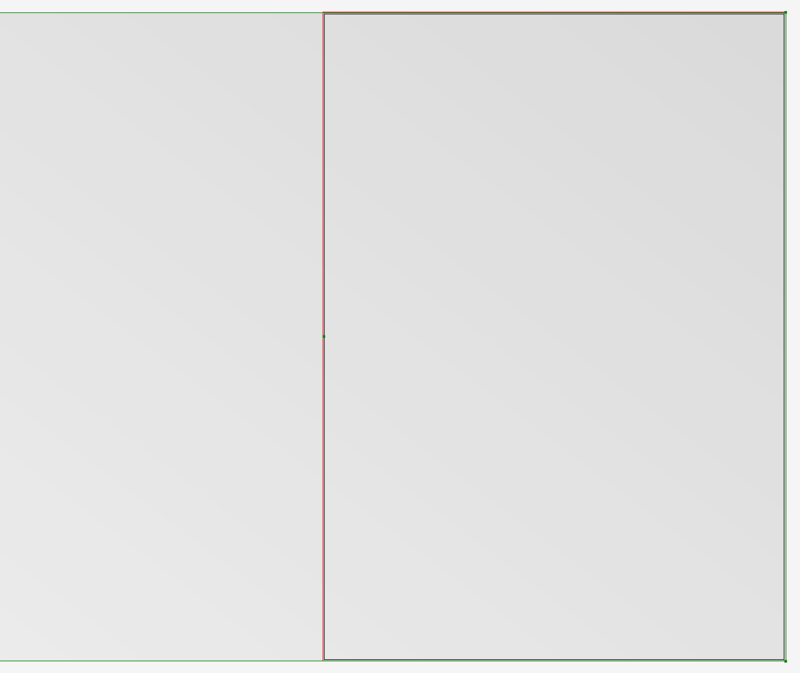 Centre the letter by selecting both the letter layer and the background layer in the Layers panel (F7) and then clicking the Align vertical centres and the Align horizontal centres in the top panel. Now repeat step 4-6 with the rest of the letters. Save each letter as a PDF for print. 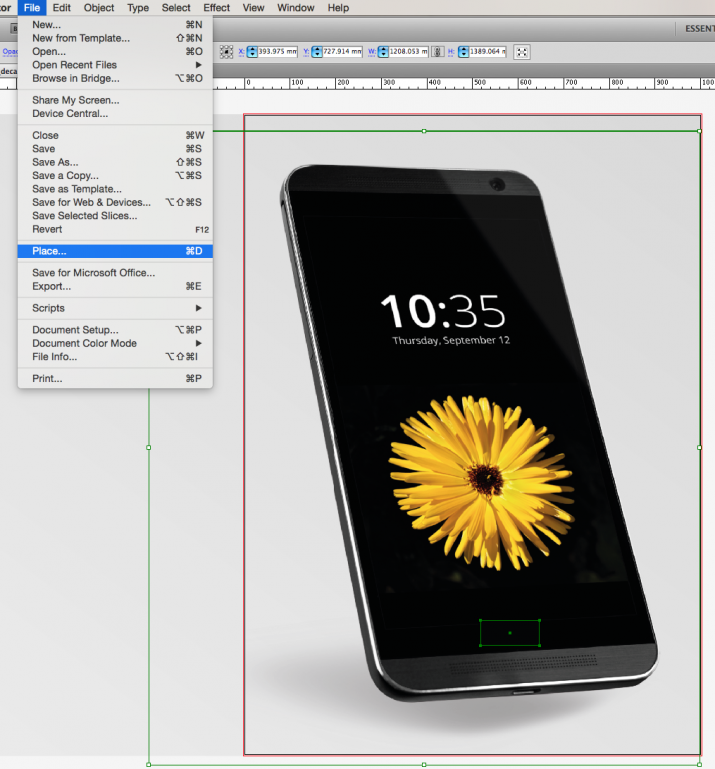 Note that the bleed is already included in the canvas size. That’s what the final result of our SALE window decals could look like. Do you like it and do you have some own ideas using window decals for a retail store? Start by downloading the AI version of the window decal size 100 x 140 cm portrait template and open it in Illustrator. We will start making the decal that will go on the left hand side. 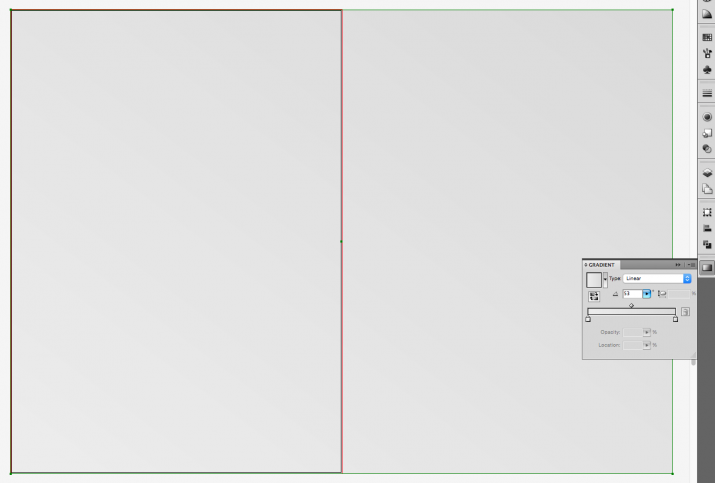 Use the Rectangle Tool (M) and draw a rectangle that is 2006 mm x 1406 mm. Make sure it goes all the way out to the bleed mark on the left hand side. Open the Gradient Panel (CTRL + F9) and put a linear gradient between 10 % black and 20 % black with a 53° degree angle. 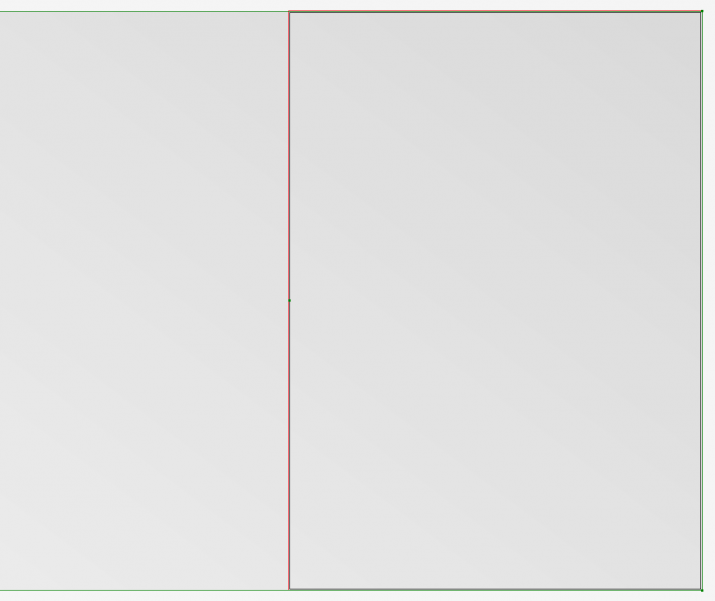 Use the Type Tool (T) and make a rectangle across the artboard. The font used here is Open Sans Bold in size 400 pt, centred. Make another textbox below and size this text 250 pt. In a textbox at the bottom of the page, write your call to action text in bold and 150 pt. 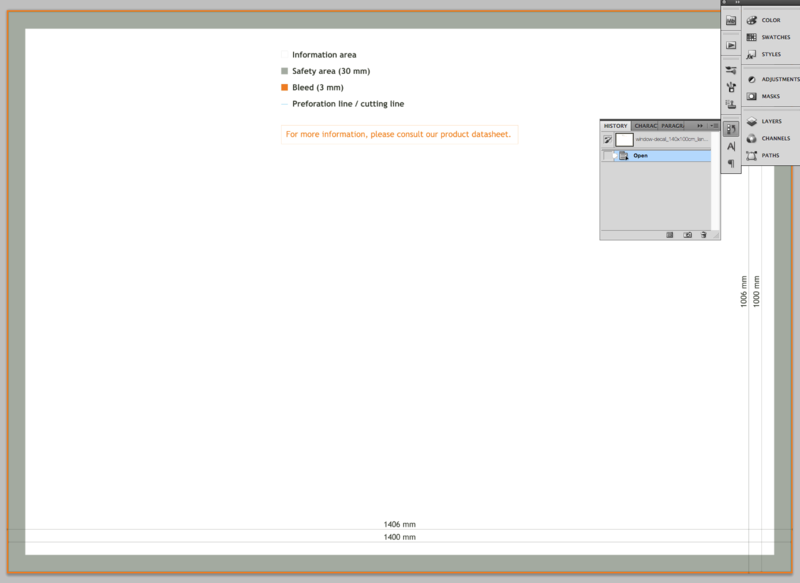 Open a new copy of the template that you downloaded. 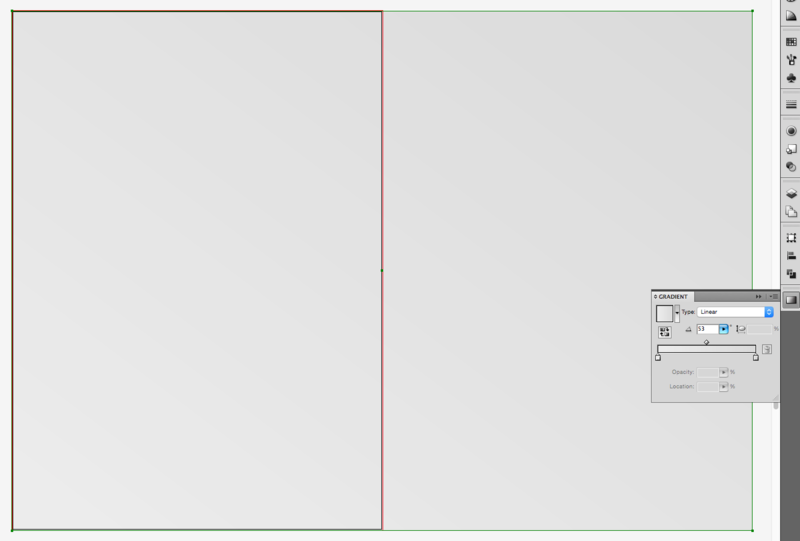 Copy the grey rectangle that you created in step 3. Place it in the right hand corner of the bleed marks. This will ensure the gradient will go across the two window decals to make it look like one. Place your image by clicking File > Place and choosing your image. Place it in the middle of the artboard. The design is now ready! 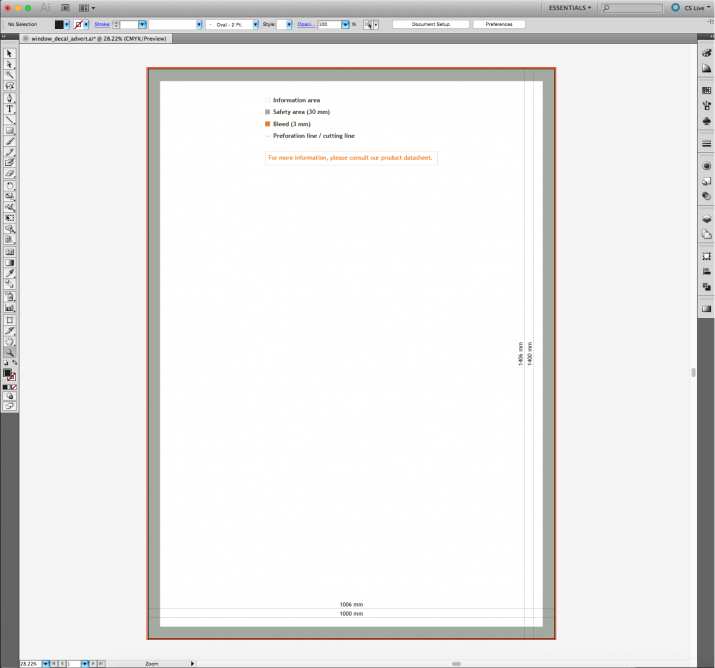 Save a PDF for print using 3 mm bleed on both files. How do you like this one? Please note: under certain circumstances, window decals used for vehicle advertising can cover the rear and rear side windows; for safety reasons, a decal cannot cover the windscreen or front side windows used by the driver. Please research and follow all predetermined guidelines and regulations for vehicle advertising when creating your window decals.